In this comparison review we’ll be taking a look at Shopify vs Squarespace to find out which platform will be best to start your ecommerce website. Read on to find out more about these popular platforms, including their pros and cons and our thoughts on why you should pick one over the other. An eCommerce website can now be built using the services of hosted solutions such as Shopify and Squarespace – both these platforms claim to offer an easy way for anyone to build a fully-functional and professional online store. The reality however is that these eCommerce store builders are not the same. They’re same in the sense that they’re both paid software-as-a-service (SaaS) products. But while Shopify was built from scratch as an eCommerce platform, Squarespace started out as a website builder. As SaaS products, both these services are quite popular, albeit for different reasons (which we will explore in detail). That’s because eCommerce features are a relatively recent addition to Squarespace. That naturally makes it a Shopify competitor but can it really stand its own ground against a product that was built solely for the purposes of eCommerce? 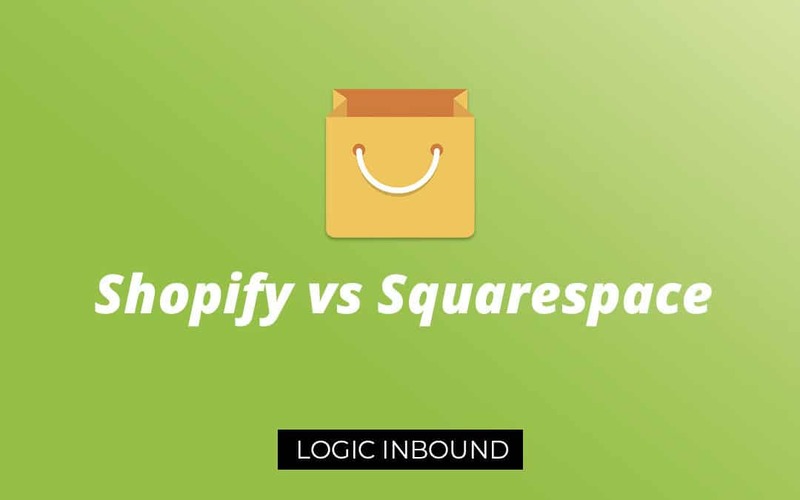 In this Shopify vs Squarespace comparison, we’ll be exploring the various similarities and differences between these two eCommerce platforms. After evaluating both, we’ll provide a list of reasons as to why you should consider one of these over the other. Do You Want to Build a Website or an Online Store? Which Platform has Better Customer Support? Is Squarespace More Affordable Than Shopify? So Which is Cheaper, Shopify or Squarespace? Do you want to build a website with some eCommerce features, or a complete eCommerce store? Before we get into our detailed analysis, we want you to ask yourself a simple question: “do I want want to build a website or an online store?”. Please realize that an online store is a completely different system compared to a regular website. 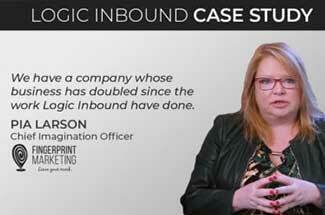 An online store has to process transactions, store customer records, handle orders and so on. It’s a fairly complicated digital system. Of course, an online store is accessed through a web address which technically makes it a website, but I digress. If you’re looking to setup a website with the purpose of conveying information, then Squarespace is the easy choice. It’s what it was built for. Using Squarespace anyone with basic technical knowledge can build a fairly attractive website in a matter of hours. Squarespace’s focus is definitely on keeping things simple, as the interface is highly minimalist. However we do have to applaud them for offering a fair amount of customization options as well. For those looking for deeper, code-level customization there’s also the developer’s platform which is intended for use by web design agencies. It let’s you go pretty deep with customization but you obviously have to know your stuff to do it. We recommend Squarespace if you’re building a website, not an online store. That’s a completely different matter, and the main point of conversation with this article. 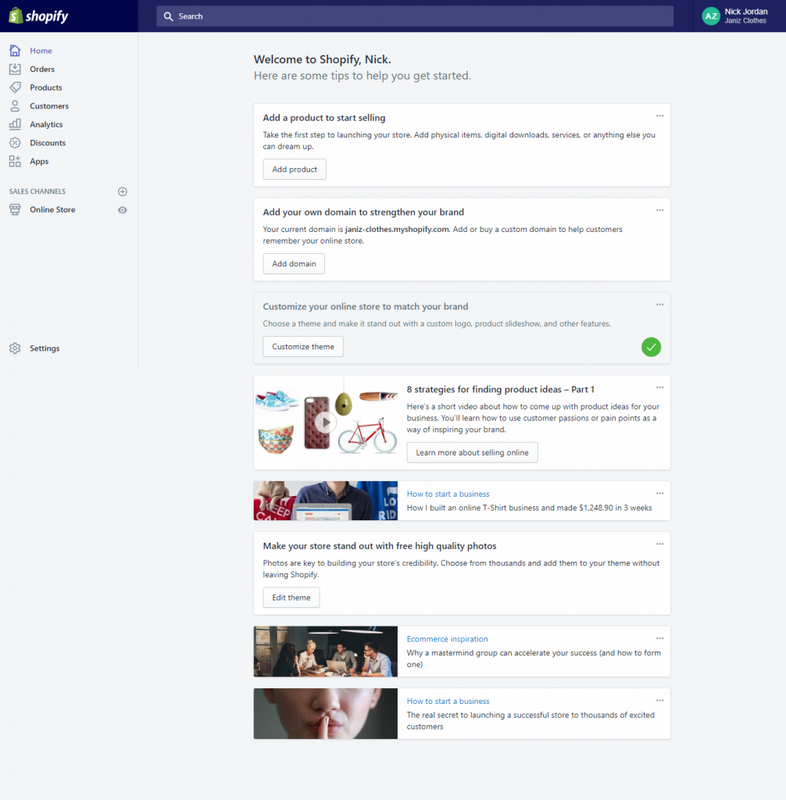 Shopify is a bespoke, built-from-the-group-up ecommerce platform. It has been designed to let you create an online store. Squarespace is a website builder primarily, with sprinklings of ecommerce features. Of course we want you to find out in detail the features that separate these platforms. But to keep it simple, you should strongly consider Shopify over Squarespace if you want to sell online. It has been built to cater to needs of digital selling, and is designed to generate more sales for your business. Our detailed comparison follows below. Templates provide a way for online businesses to make a great first impression on their customers. 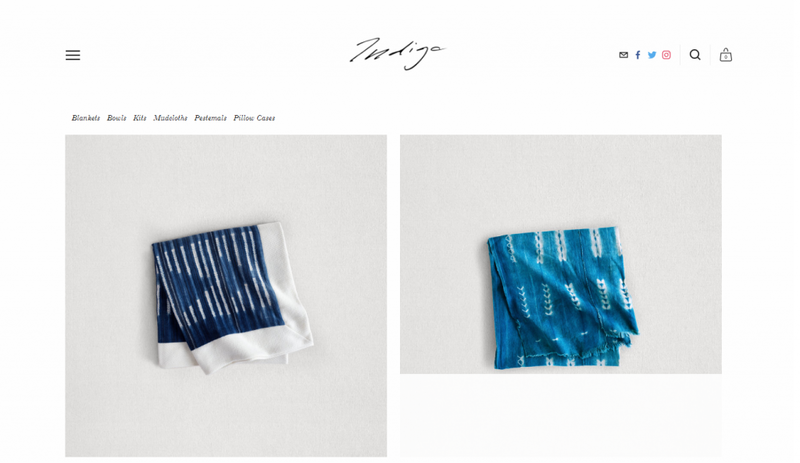 An eye-catching template will make the website appear more ‘inviting’, and will encourage users to browse around the store and find the items they’re looking for. But it isn’t just enough for a template to feature an eye-catching design – it has to be intuitive and easy to navigate as well. Good website design can also have a positive effect on your website’s search engine optimization (SEO). An attractive website retains its visitors better, thereby reducing bounce rate. A low bounce rate is viewed favorably by Google, which is definitely good for your SEO. Before choosing a template, make sure that it has been optimized for viewing on mobile devices because a significant portion of your daily traffic will consist of mobile users. 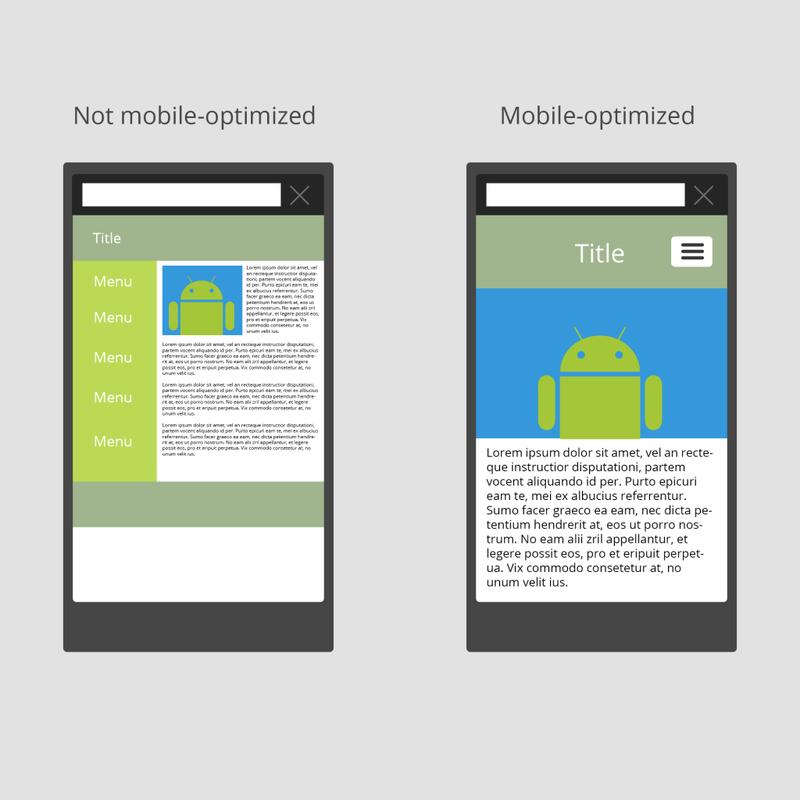 What’s more, Google has made mobile users a priority ranking factor for its search results. Templates for Shopify can be found on their official template store. The store offers a selection of 62 templates, out of which 10 can be used for free. Each of Shopify’s templates comes in 2 or 3 design variations so there’s quite a lot of choice for the user, even with the 10 free templates. From a design point of view, each one of the templates appears to have a modern and professional design. Even the free templates look clean and crisp and offer a fair amount of diversity to users. Naturally, the free templates do not cover every business niche out there and in that case users will have to opt for one of the paid-for templates. The paid-for templates start at $140 and go up to $180. If you’re willing to pay for a template but can’t quite find a design you like on the official Shopify template store, try looking in third-party marketplaces. Theme Forest and Template Monster are both recommended in this regard as they have strict policies for quality control. Before purchasing a Shopify template from third-party marketplaces, make sure that the template’s developer offers after-sales support. The official Squarespace template store offers a selection of 90 templates, which is great considering Shopify offers only 65 in total. However, only 14 of these templates are meant for eCommerce while the rest are for regular websites and blogs. The great thing about Squarespace templates is that they are all free. Users with a Squarespace subscription automatically get access to all templates. The small selection of eCommerce templates definitely limits options for users though. The eCommerce templates also appear to be geared more towards individuals who want to showcase a small number or products or services. From a design perspective the templates are pretty contemporary and professional. But the selection lacks in variety and that will undoubtedly limit the appeal of the platform as a whole. 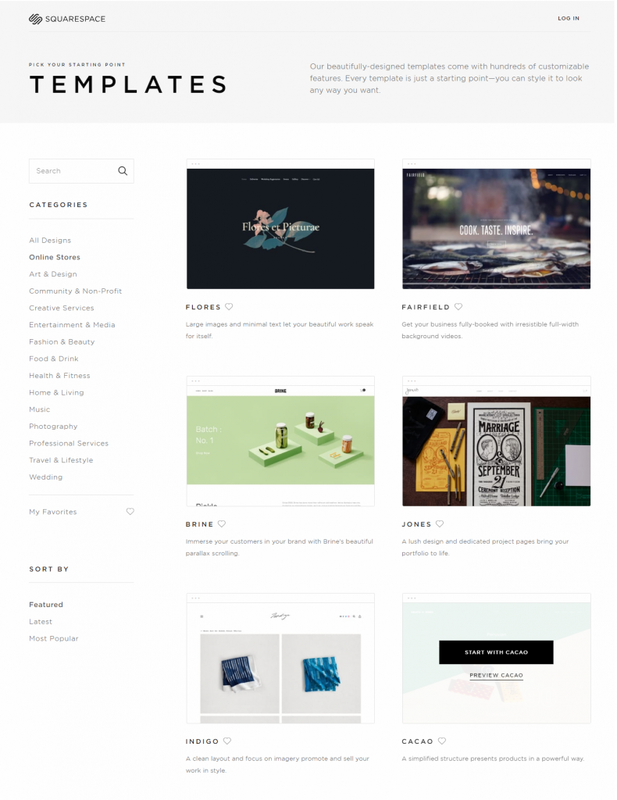 There aren’t any third-party developers for Squarespace templates either – the only place to get templates for the platform is from the official Squarespace template store. Access to reliable and helpful customer support is vital to the smooth operation of any eCommerce business. If your online store is facing issues it could result in lost sales because of frustrated customers. Shopify offers 24/7 online support for all of its users. This includes round the clock access to support through live chat, email and a phone line. In practice, we found Shopify support to be really helpful in resolving most issues. Squarespace offers online support for all of its users. Support can be reached via live chat and email. Phone support is not available which is definitely a drawback considering that Shopify users have 24/7 access to it. There are set timings for live chat support (Monday through Friday from 4am to 8pm), during which support personnel are generally easy to reach. Email support is available 24/7 so Squarespace customers can always avail help from a real person, even if this form of support is not very prompt. 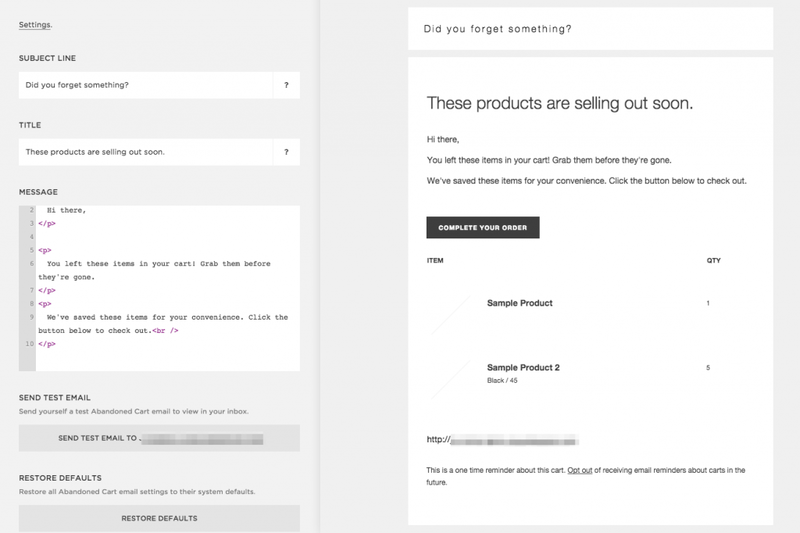 Shopify and Squarespace offer 14-day trial periods to anyone who wants to use test their platforms. After 14 days, users are expected to ‘upgrade’ to a paid subscription plan. *Shopify Plus is a tailored subscription plan for high-volume merchants. Pricing for this plan is variable but reportedly hovers around $2000 per month. As you can see from the above table, Shopify offers a 10% discount to users who opt for annual billing. One thing to note is that the Lite plan doesn’t really give access to the platform’s store building tools. Rather, it allows users to sell products through an existing website or Facebook page, or at a physical point of sale location. The Basic Shopify plan on the other hand provides users with everything they need to start an eCommerce website. Advanced features like abandoned cart notifications and gift cards are only available on the Shopify plan ($79/mo) and up. 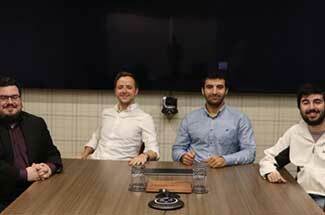 Squarespace offers a total of 4 subscription plans, only 3 of which give users access to the platform’s eCommerce features. For the purposes of this article, we’ll be talking about the plans which offer eCommerce features. The naming for Squarespace’s pricing plans is quite confusing – why is the Basic plan more expensive than the Business plan? That is because the Basic and Advanced plans are billed as plans meant for eCommerce purposes, while the Business plan is meant for regular websites but it also happens to have some eCommerce functionality in it. For users who want to use Squarespace to build an online store, we recommend going for the dedicated eCommerce price plans (Basic and Advanced). The Business plan is only slightly cheaper but misses out on necessary features such as advanced eCommerce reports. Abandoned cart notifications are only available on the Advanced plan ($46/mo). But to be fair, Shopify offers this feature on the more expensive Shopify plan ($79/mo). Transaction fees are levied by eCommerce platforms when a transaction (such as a sale) is conducted through them. Shopify charges a transaction fee of up to 2% on each sale, but this can be avoided if users choose the platform’s built in payment processor – Shopify payments. Without Shopify Payments, users have to pay the transaction fees – up to 2.0% of each sale – plus the credit card rates for the third-party payment gateway (Stripe, for example). Shopify Payments not only removes the transaction fees but also provides slightly lower credit card rates. The only problem with this payment processor is that it is not available in many countries. Currently, it is only available for Shopify merchants based out of the United States, Puerto Rico, Canada, the United Kingdom, Ireland, Australia, New Zealand and Singapore. Shopify merchants elsewhere will have to choose a different payment processor. Fortunately, there are over 100 payment gateways that integrate with the service. Squarespace meanwhile charges a transaction fee of 3% for its Business plan only. If users opt for the eCommerce-centric Basic and Advanced plans, they do not have to pay any transaction fees. However, credit card rates do still apply and for that Squarespace gives users the option of choosing between Stripe and PayPal as the payment processor. But even though PayPal and Stripe are quite popular and widely available throughout the world, there are still some countries that do not support them. In this article we’re comparing Shopify and Squarespace solely on their merits as ecommerce platforms. So keeping that in mind, let’s discuss which one is cheaper when it comes to selling online. The cheapest Squarespace plan that allows you to sell online is the $26-per-month Business plan. This wasn’t the case before as ecommerce features were also available on the $16-per-month Personal plan. That changed with Squarespace’s pricing structure updates. So now the cheapest Squarespace plan which allows you sell online is $26 per month, which is just a few dollars shy of Shopify Basic ($29 per month). But consider this, Squarespace is a website builder with ecommerce features tacked on. It is not a full-bore ecommerce platform designed to get you maximum sales. Shopify on the other hand is purpose-designed for ecommerce, and has the features to match. Plus, we have to consider the transaction fees, in which Squarespace is behind. Squarespace charges 3% of each transaction as fees, while Shopify charges just 2%. What’s more, you can avoid Shopify transaction fees with Shopify Payments, which is an excelletn payment processor. So if you’re selling products, Shopify will be cheaper than Squarespace. Why does popularity matter when choosing an eCommerce platform? The tech industry is fiercely competitive – the more popular a product is, the more its chances of survival. An unpopular service will fail to generate meaningful revenue and will thus be at the risk of shutting down. Fortunately, both Shopify and Squarespace are quite popular. But Squarespace is popular primarily for its site building capabilities and not as an eCommerce platform. That is why we’re curious to find out how its eCommerce offering stacks up against one of the most popular eCommerce platforms – Shopify. 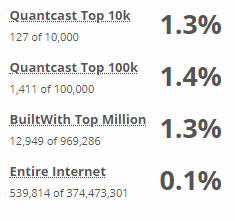 Shopify is currently the leading hosted eCommerce platform. More than 500,000 eCommerce businesses use the service, putting it in front of direct competitors such as Squarespace and BigCommerce. Squarespace eCommerce is quite popular in its own right. It currently powers around 300,000 eCommerce websites around the globe. Google’s search trends are a great way to gauge user interest for a particular product or service. We performed a comparison for the keywords ‘Squarespace’ and ‘Shopify’ to find out which term gets the most amount of interest on Google. Search interest for Squarespace has been largely stagnant over the years, while for Shopify it is growing at a steady pace. Shopify is clearly the more popular platform in Google searches. Judging by the image shown above, it is clear that Squarespace customers are choosing to migrate to Shopify in great numbers. Squarespace is also gaining customers from Shopify, but at a significantly lower rate. Plugins and widgets are a great way to make up for shortcomings in a platform’s feature set. What’s more, a platform with a boatload of built-in features might become unnecessarily complicated for its users. This is why developers choose to keep a platform fairly basic at its core, but allow plugin integrations for greater flexibility. 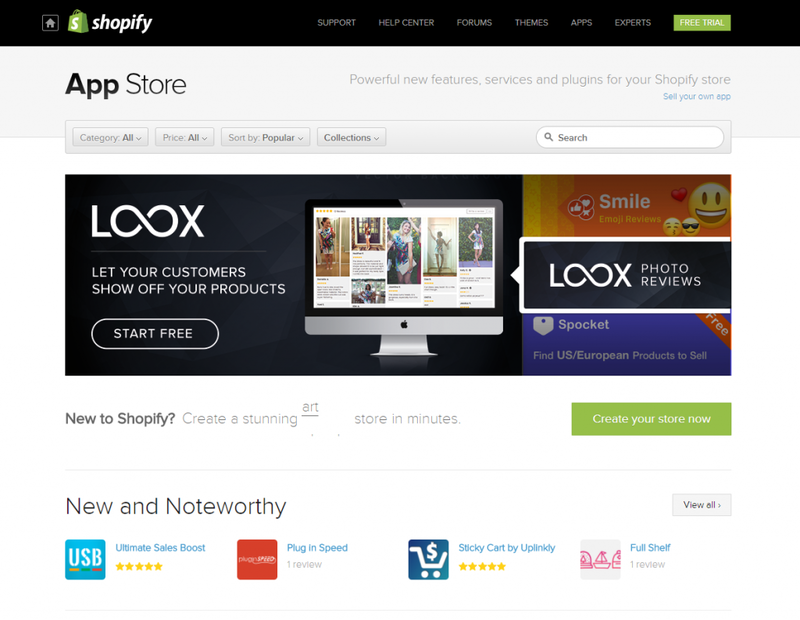 Shopify refers to plugins as ‘apps’, and offers more than 2000 of these ‘apps’ on its official App Store. Owing to the platform’s popularity, third-party plugin support is quite strong and the number of apps on the App Store is proof of this. The App Store itself is very well-designed with an intuitive interface which makes browsing through the various apps on offer a pleasant affair. Unfortunately with Squarespace, users are limited to the functionality offered by the platform only, since there is no official plugin store. Squarespace does allow for custom integrations through its Developers Platform but – as the name suggests – it’s recommended for skilled developers only. Shopify was built as an eCommerce platform while Squarespace is a simple website builder that has eCommerce features in it. 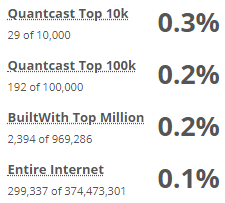 That is what makes a feature comparison between these platforms quite interesting. Can Squarespace’s eCommerce features really measure up against what is widely considered as one of the most comprehensive eCommerce solutions available? 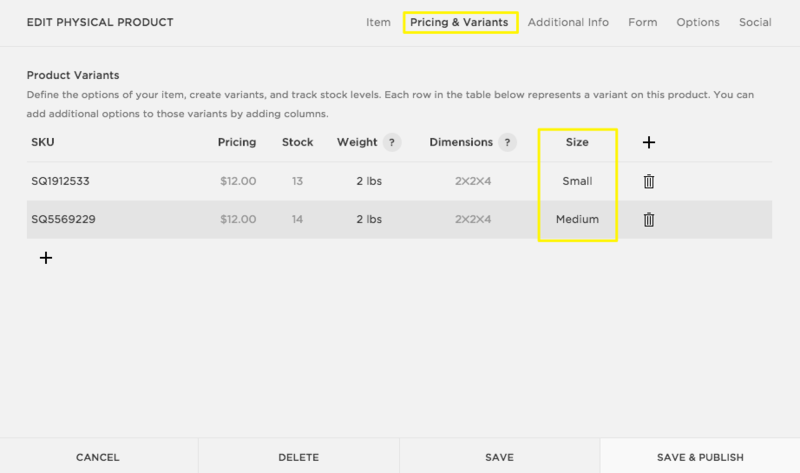 Shopify allows users to add up to 3 options for a product. So for example, a t-shirt might have options such as color, size and material. If you want to add a fourth option such as material, you’re out of luck. This can be remedied by third-party apps available on the App Store but the platform itself limits users to 3 product options only. Squarespace allows for up to 100 product variants. Squarespace on the other hand allows users to add an unlimited number of options for each product. 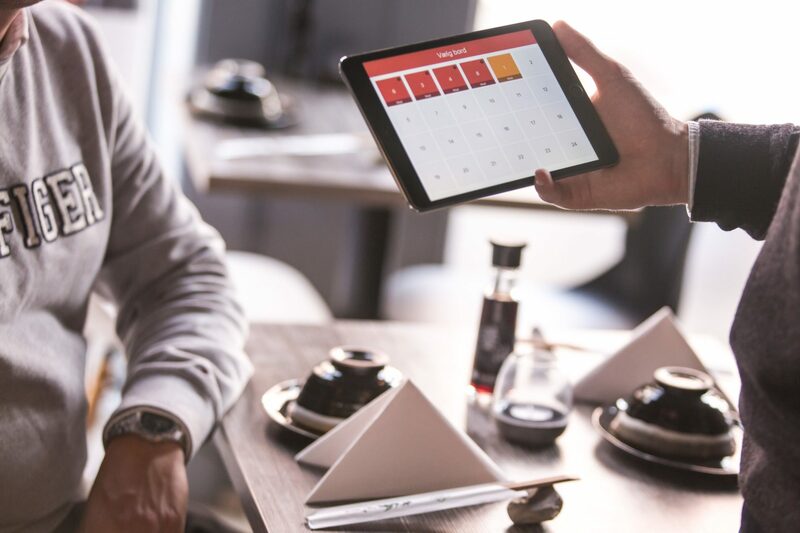 Point of Sale (POS) support is a vital feature for online businesses that want to grow by offering their product lineup at physical locations. 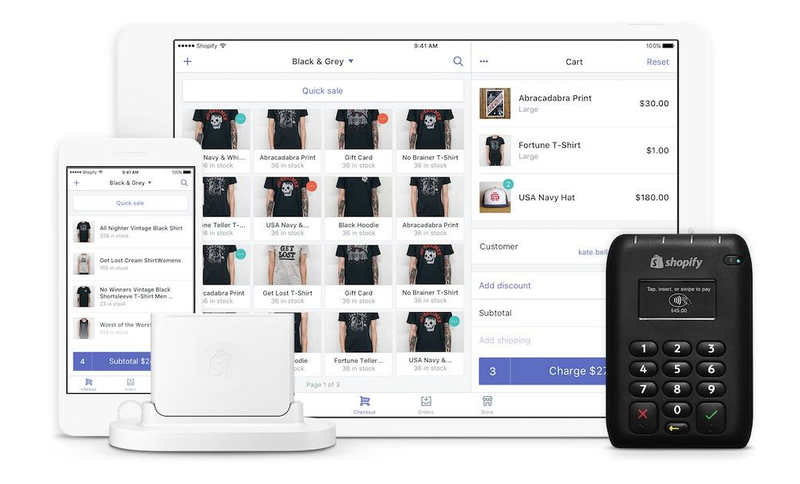 Shopify offers users a fully-integrated POS system. The service even offers official hardware to facilitate POS sales. This includes a bar code scanner, a receipt printer, a credit card reader and a till. And because this is official hardware, it can be seamlessly integrated into your Shopify store. Unfortunately with Squarespace, users will be limited to selling their services or products through their online store only since there is no POS support available. Dropshipping is a popular business model for eCommerce websites. 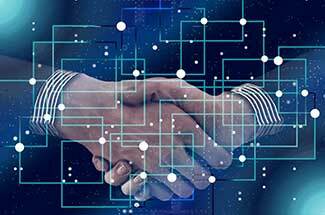 It allows users to effectively become middlemen by offering products on their websites that will be shipped by a third-party retailer. There is no need to worry about inventory levels or shipping – simply advertise the products effectively and convey the orders to the retailer. If you’re interested in this type of business then Shopify will be better suited for the job as there are a wide range of dropshipping apps available for it. Squarespace definitely lacks in this regard as there are no dropshipping apps available for it. Augmenting advertising efforts with some content marketing is a great way of attracting traffic to your eCommerce store. For this, both Shopify and Squarespace offer a pretty intuitive way of setting a website blog. But since Squarespace is at its core a content management system (CMS), its blogging features are more extensive than Shopify’s. For example, you can easily embed a blog to any part of your website in Squarespace, something you cannot do in Shopify. 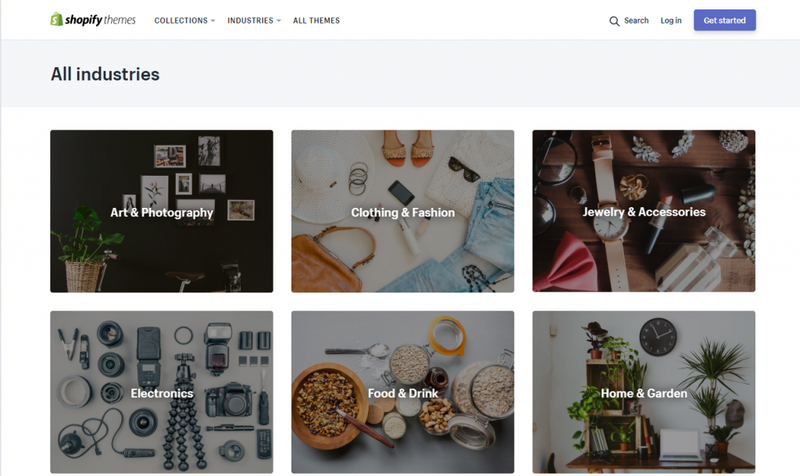 Content categories are also notably missing in Shopify, but present in Squarespace. Shopify provides users with a thoroughly detailed reporting feature. Using Shopify’s analytics users can get detailed stats for finance, sales, customer, acquisition and behavior reports. Squarespace has fairly decent reporting features as well, but they’re not quite as extensive as what Shopify offers. Abandoned cart recovery allows eCommerce businesses to automatically send email reminders to customers who add items to their cart but do not go through with the purchase. It’s an effective way of increasing overall sales and fortunately, Shopify and Squarespace both offer this functionality. Shopify allows users to send abandoned cart notification emails after specified durations (1, 6, 10 or 24 hours). This is because according to Shopify, customers who abandon their carts are more likely to come back and complete the purchase if they get a notification email within 1 to 10 hours. Squarespace has an abandoned cart recovery feature as well, however, there is a slight limitation to the way it implements it. That’s because it automatically sends abandoned cart notifications after a set time period of 24 hours. If the user wants to send an email notification according after a duration of their own choice, it’s simply not allowed through the platform. The main draw of tools like Shopify and Squarespace is that they can – apparently – be used by anyone to create professional eCommerce websites. But how easy to use are they in practice? For store setup we gauge the time it takes for users to setup a basic online store. Shopify and Squarespace both make it incredibly easy for anyone to get started with building an online store. There are no technical hoops to jump through – simply go to their respective websites and sign up for an account to get started. In terms of time taken to initially setup the store, we can’t really find any differences between Shopify and Squarespace. 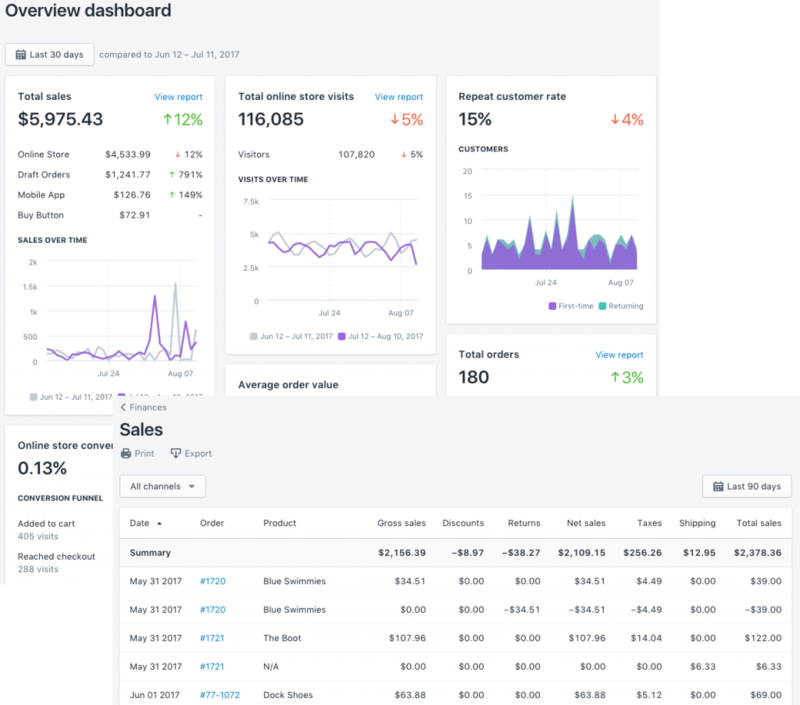 Shopify and Squarespace offer extremely easy to use and intuitive backend dashboards. 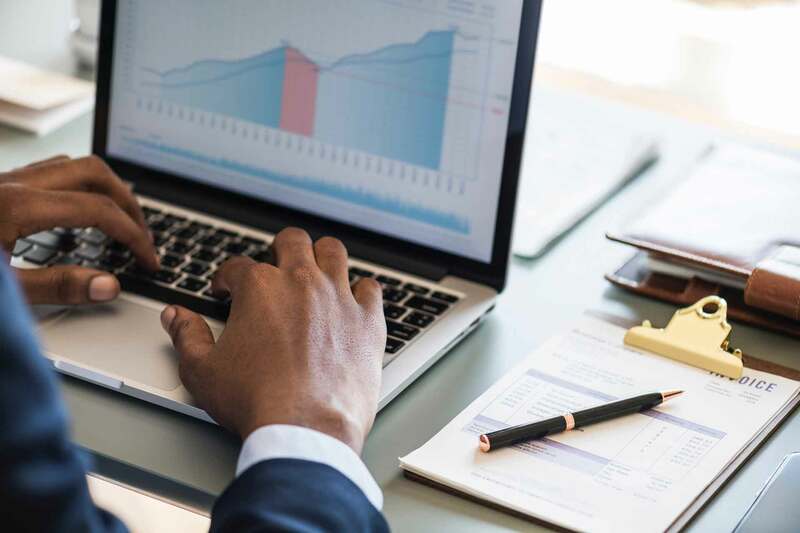 Both allow easy access to common eCommerce administration tasks such as product and inventory management, storefront customization and analytics. The design and aesthetic of both dashboards is quite clutter-free and minimalistic. However, Squarespace takes this a bit further and offers an extremely simplified interface which is very beginner-friendly. The Shopify dashboard offers a very handy search feature in its dashboard. If you’re unclear as to how to accomplish a certain action, simply enter a few relevant keywords in the search bar and it will return very helpful results including navigational links to various parts of the dashboard. Squarespace lacks a similar ‘intelligent’ search function. But on the whole, we’re inclined to say that both of these dashboards are quite similar in terms of ease of use. Shopify and Squarespace allow users to customize the visual appearance of eCommerce stores without the need to fiddle around with HTML or CSS. This is done through the platforms’ site editor functionality. The Shopify site editor is easy to get to grips with and has an intuitive user interface. Even novice users can easily use it to customize the look and feel of their online stores. The Squarespace site editor is also very well thought out and easy to use. It has a clean and clutter-free interface and there’s no widget/feature overload to confuse users. Customization options are easy to understand and novice users will have no problems getting to grips with it. The reason we ask this is because Shopify and Squarespace are very different products. Shopify was created from the ground up to be an eCommerce platform while Squarespace is at its core a website builder. 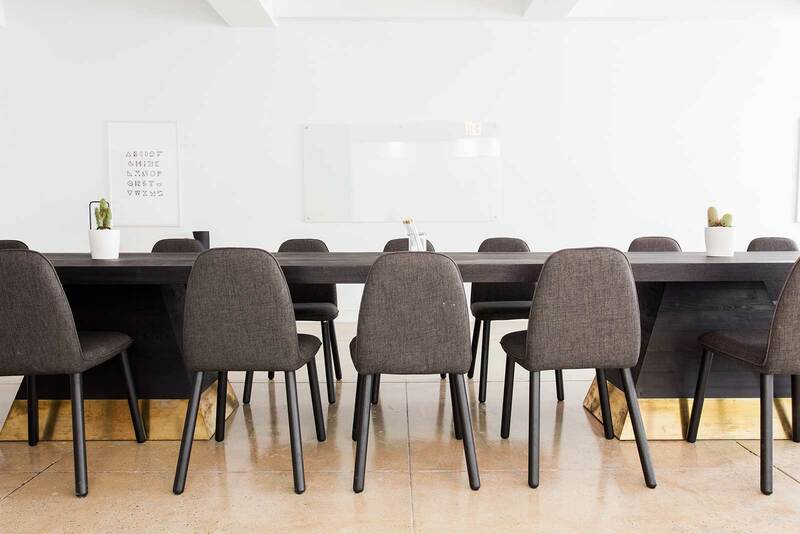 If you want to build a website whose main focus is on delivering content – and not selling products – then Squarespace is simply the better option. An example for this would be bloggers who want to sell 2 or 3 eBooks on their website. In this case, the owner’s blog will be the prime focus of the website. And since there are only 2 or 3 products to sell, Squarespace will manage it without issue. For websites like these, content management features are much more important than eCommerce features. And because of that, Squarespace is a great option for individuals or small businesses who want to showcase a small number of products through a good looking, professional but small online store. Bespoke eCommerce platform built from the ground up to facilitate online selling. The service’s focus is on introducing better eCommerce features and improving the ones it already has. Hugely popular, as a result of which it has great third-party support. Squarespace has very limited third-party support. Better selection of templates (more than 500) on official and third-party marketplaces. 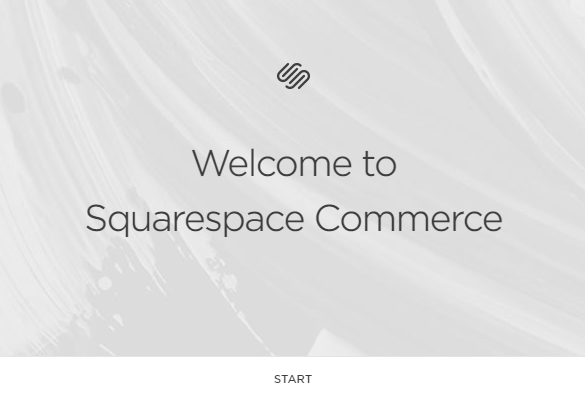 Squarespace users are limited to just 14 eCommerce templates. 24/7 access to live chat, email and phone support. Squarespace has no phone support and its live chat support is only available during specific timings. 2000+ plugins give Shopify great flexibility in terms of features. Fully integrated, proprietary point of sale (POS) system complete with official POS hardware. Squarespace has no POS support. Supports more than 100 payment gateways. Squarespace only supports PayPal and Stripe. Deeper and more extensive reporting analytics. If the main aim is to build a content-driven website that sells a few products. No transaction fees on ‘Basic’ and ‘Advanced’ plans. Shopify users pay transaction fees regardless of price plan unless they choose Shopify Payments. Abandoned cart functionality is available on the $46-per-month Advanced plan. To get the same feature in Shopify, you have to opt for the $79-per-month Shopify plan. Between Shopify and Squarespace, Shopify is simply the better eCommerce platform. With its competitive pricing (starting at just $9-per-month for the Lite plan), extensive feature sets and solid third-party developer support, it is an easy product to recommend.